I am an American college student. When I was 21 years old I had an existential crisis and decided to drop everything I was doing and follow my life-long dream of going to Africa. After much deliberation and contemplation I organized a trip to Kenya where I could use my skills to teach English at a school. I made arrangements with a school: Filadelfia School for the Destitute and Orphaned. After a day or two or getting acclimated to a new culture, it was time to dive in. Suddenly I was the teacher of 55 first graders. I relished in the chance and by the end of my three months there I had grown close to every one and loved Kenya. This school compound was founded and supported by Danish Christian missionaries. I myself am an atheist, but I didn't see a problem. After all, I was teaching English and there was no need for my beliefs to be brought up or for me to try to 'indoctrinate' any one else; just stick to the English. Over my three month time there, I wasn't the only white foreigner on the compound. People would come and go, some to teach, some to help in one way or another. I was, however, the only non-missionary. By the end of my time in Kenya, I learned a lot. A lot about myself, a lot about the world, a better grasp on what I wanted in life, etc. I also learned that missionaries are one of the most contemptible people out there. "Are you a Christian?" he asked. Uh-oh I thought. But I wasn't going to lie. "No" I said simply. He gritted his teeth "Then what are you doing here?" he asked with a tone of anger in his voice. I knew I was in a potentially troublesome situation so I tried to keep it simple. "Teaching" I responded. He stood up and sighed "Why would you be in this country if you weren't a Christian!" and walked off. Their entire mission there is to turn on as many people to Christ as they can. A mission like this can't help but show ugliness. It started one day when my students had been pretty good and I thought they might like to hear some songs from my country. One of the missionaries on the compound had a guitar and since I play a little bit, I went to ask if I might borrow it for an hour or so. 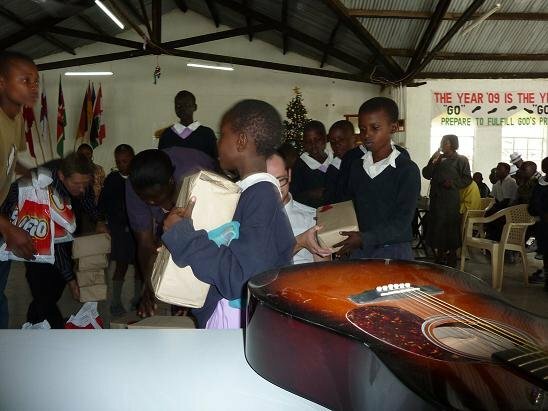 I explained the situation to him; that my students had quickly got through today's assignments and behaved very well (as anyone in charge of 50 some 5-6 year olds will tell you is a rarity demanding reward) and that I might borrow his guitar for about an hour to see if they'd like some songs. "What kind of songs were you going to sing?" he asked. I hadn't really thought of it, "I dunno" I said "some old folk or blues songs. Some old love tunes. Just something nice they might like to hear from my country." "Were you going to sing any Christian songs?" Of course I wasn't going to sing any Christian songs as I wasn't a Christian but I respectfully said "Oh, I don't know. I hadn't thought about it. I guess I don't know any." He told me he didn't want the kids passing his guitar round and "grubbing it up". I assured him I wouldn't pass the guitar around, but it was no dice. Instead I sung some songs with the kids without a guitar and we all shared some songs and went out to play soccer. So much for charity. The incident I'll never forget happened outside the compound. The head Danish honchos had come down around Christmas time to see how things were going. I had ran into one outside and we talked for a moment. He asked me how I liked it here in country and I told him I loved it, as I did. I asked him and he said that he couldn't wait to return home. "It smells here" he said. "Are you a Christian?" he asked. Uh-oh I thought. But I wasn't going to lie. "No" I said simply. He gritted his teeth "Then what are you doing here?" he asked with a tone of anger in his voice. I knew I was in a potentially troublesome situation so I tried to keep it simple. "Teaching" I responded. He stood up and sighed "Why would you be in this country if you weren't a Christian!" and walked off. This missionary found Kenya so disgusting that he was only here because he thought that he was getting his ticket to heaven. I can't lie and say I didn't go for myself, but I loved every minute. I learned so much! I have a dozen more stories about the lack or morals exhibited by missionaries during my time in Kenya, some worse than others, but I think it's all summed up in the last story. Every missionary I met didn't seem to enjoy it there, didn't want to be there.